Online Certification Course for Level 1 Thermography Certification as published in CP-105. Meets the training hours in recommended practice and is in accordance with the SNT-TC-1A Guidelines. Professional Infrared Training Institute is now offering online courses for Thermography Certification, IR Moisture Survey, IR Energy Loss Survey, and Thermal Infrared Certification for Insulation Inspection and Remediation. As heating costs continue to rise and energy efficiency becomes a greater concern to the world, proper insulation and ventilation techniques are more important than ever. Homebuyers are becoming more conscious of a home's potential energy costs before purchasing a home and existing homeowners are beginning to look for ways to reduce their existing heating or cooling bills. Proper insulation and ventilation techniques are some of the most efficient ways to lower heating and cooling costs. Knowing how to identify deficiencies and weaknesses in insulation gives you a marketable skill in the inspection industry and allows you to properly remediate insulation or ventilation problems. 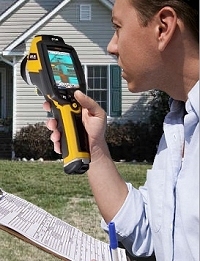 Professional Infrared Training Institute is a division of the Professional Home Inspection Institute, a leader in online interactive training & certification for the real estate inspection industry. Professional Infrared Training Institute offers Level 1 Thermography Certification Courses online as well as other related infrared training courses. This 24 hour course teaches you to use an infrared camera to perform thermal inspections of insulation and also teaches you how to use an infrared camera when remediating insulation defects, missing insulation, or improper ventilation. Topics include terminology (terms for infrared camera inspection and insulation terminology), attic insulation/ventilation, basement insulation, crawlspace insulation/ventilation, wall insulation, straw bale insulation, windows and doors, cathedral ceilings, thermal inspection, remediation, and more!